DURING THE DEVELOPMENT OF THE R1 V2 WE EXPERIENCED THE OVERALL ENHANCEMENT IN PERFORMANCE ACHIEVED FROM A LIGHTER WEIGHT KITE. The UltraLight version offers true performance increases and enhanced flying characteristics compared to the standard Chrono V2. It inflates quicker, launches in lighter winds, flies faster, stays in the air longer in gusty conditions, and is more reactive even in the lightest breeze. Weight and packing volume is reduced to a minimum, ideal for travelling and expeditions. The Chrono V2 UltraLight is 25% lighter than the standard Chrono V2, and packs down to around half the size! The technical backpack is the same design as the standard version, also using lighter materials saving weight once again. The Chrono V2 UltraLight will be produced on request only, please contact your local dealer/distributor and order early to plan for production and delivery time. The Chrono V2 is the ultimate all-round foil kite delivering outstanding performance on all surfaces – water, land or snow; covering all riding styles from freeride, light wind, boosting, foiling and racing. Our design goal with the second version was to take the original Chrono’s high performance characteristics and make it easier to use for riders looking for all-round ability in any conditions on any surface. The Chrono V2 is more stable and easier to inflate; additionally this model has thicker sheathed Dyneema bridle lines to reduce tangles on the ground. New sizes cover a wider range of conditions to personalise your high performance quiver. 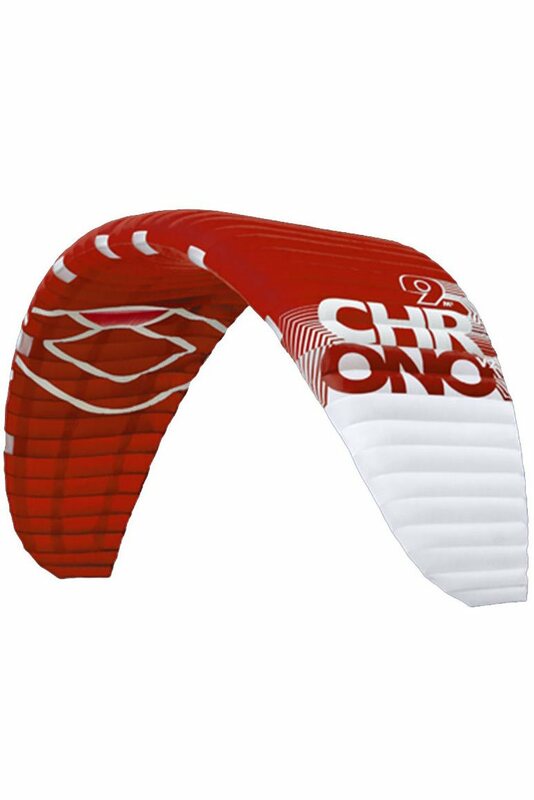 The Chrono V2 Ultralight is for advanced riders only who have previous foil kite experience. It is not difficult to fly but there are techniques required to fly a high aspect ratio foil kite. Our R&D team has longevity and performance tested the new light weight materials proving durability and dynamics. These materials have been extensively used on our Ultra Light Kites and Paragliders for the past four years. The kite must be carefully looked after, it needs an experienced rider who knows how to keep the kite up in the air and how to handle it gently on the ground. The kite is water re-launchable, but we recommend that you keep it flying and out of the water if possible! Using the Brake Handle it is possible to reverse the kite off the water and continue riding, we recommend you practice this technique. A drainage system on the wing tip allows any water that may have entered the kite to drain out. Do not use the kite in waves. This kite features a simple and effective front line flag out release. After releasing the flag out you should check the speed system, bridle lines and your flying lines for twists before restart. The Speed System and Bridle lines will require maintenance just like any high performance equipment in racing sports - they must be checked after every 60 hours flying time, if they are worn or are not to factory specifications (+ or - 15mm) they must be replaced or the kite will not perform as designed. Tested the Ozone Chrono Ultra Light 11m in the snow. Two times, one with a 5 knots of wind on one time in a comfortable 12/15 knots. First if there is no win at all the Ozone Chrono Ultra light would be the first one to fly. Its amazing what weight do with a kite. I couldn't believe the ease of control even in the slightest breeze of wind. Amazing! In the moderate wind part the kite has a great fly feel. Easy to control, stable, nice feedback on the bar, actually just what you expect. The turning circle is probably a bit wider as the snowkite series like the Ozone Summit, but for me still great for crouzing and playing around in plains or small hills. I also tested the 15m Ozone ultra light on that specific very light wind day. Same feeling only the 15m had a bit more push to go uphill.